CD Review: Western Medley. | 50 Westerns From The 50s. « Happy Birthday, Angie Dickinson. I’ve always loved creaky old movies, especially Westerns, and have gotten used to people turning up their noses at whatever film I might mention. So one of the joys of riding herd over this blog for the last five years has been running into a gang of folks who enjoy these things as much as I do. Who discuss them, study them, and give them a level of respect that “regular people” can’t understand. That’s one of the things that makes David Schecter’s work at Monstrous Movie Music so special. He’s one of us. We’re his customer base. And he continues to deliver the goods. 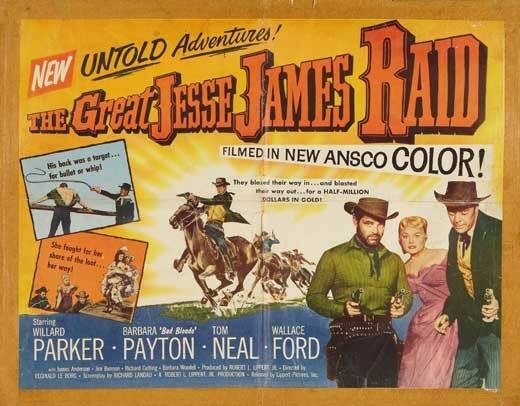 Western Medley, a two-CD set, presents the scores to three Westerns from Lippert Pictures: The Great Jesse James Raid (1953, composed by Bert Shefter), The Baron Of Arizona (1950, by Paul Dunlap) and Last Of The Wild Horses (1948, from Albert Glasser). It’s a terrific release, from the music itself to the lavish packaging to the thorough liner notes. I’m particularly enamored of Shefter’s work for The Great Jesse James Raid. Evidently, no one bothered to tell him this was just some cheap 73-minute cowboy movie. While in some ways it’s pretty conventional stuff, there’s enough music for over half the film’s running time–and it’s so well done. The film doesn’t deserve this score (or Wallace Ford, come to think of it). Haven’t spent as much time with the other scores. I’m very familiar with Sam Fuller’s The Baron Of Arizona and a fan of Paul Dunlap. He never disappoints. Last Of The Wild Horses is a nice score; many of us know Albert Glasser for his work on 50s horror and science fiction stuff. This is a set you’ll want to spend some quality time with. Recommended. Let’s hope there’s a Western Medley Volume 2 someday. And by the way, the films themselves are available through Kit Parker Films and VCI (Jesse, Wild Horses) and Criterion (Baron). 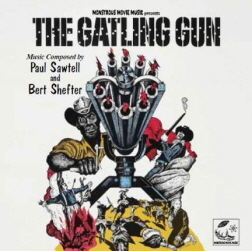 Out at the same time is Paul Sawtell and Bert Shefter’s music for The Gatling Gun (1971), a near-impossible-to-see picture with a production history that’s probably more entertaining that the film itself. Before release, the film was confiscated when one of the producers was brought up on racketeering charges. It was directed by Robert Gordon and stars Woody Strode, Guy Stockwell, Robert Forster, Patrick Wayne, John Carradine and Pat Buttram. The score’s very good, and now I’m really wanting to see the movie. The full Gatling Gun movie is on youtube. That’s a really good point, Bob. And yes, this is a CD worth having. Fine post. There are many really fine scores that add considerably to the impact of the movie. Just offhand I would cite Jerry Goldsmith’s score for Rio Conchos, Jerry Fielding’s for The Wild Bunch, Fred Karlin’s for The Stalking Moon, and Neil Hefti’s for Duel at Diablo. Many years ago Toby, I bought an LP ( before the days of CDs) called Great Western Film Themes on the United Artists label. Your current cd review prompted me to dig it out. I haven’t played it for years. It is a gatefold album containing 24 tracks. The inside of the gatefold has has a very interesting sleevenote compiled by Alan Warner. The tracks are (1) from the original soundtrack,(2) From the original picture score, and(3) original mono track. One of my all time favorite background music is for Wild Wild West. I notice background music and have many soundtrack CDs and before that lps. Apparently there are a lot of people like me who wish there was a Wild Wild West TV show CD soundtrack. One of my favorite finds was when I was finally able to get the background music to the ’50’s Superman TV show, what great music that was too. Lost In Space also had really memorable background music. I love all of Elmer Bernstein’s western music backgrounds. Bernard Hermann is my favorite composer, he did all kinds of shows radio & TV and movies. Lalo Schriffin is great on M:I & Mannix. Forgot Victor Young who also made some really haunting pieces.